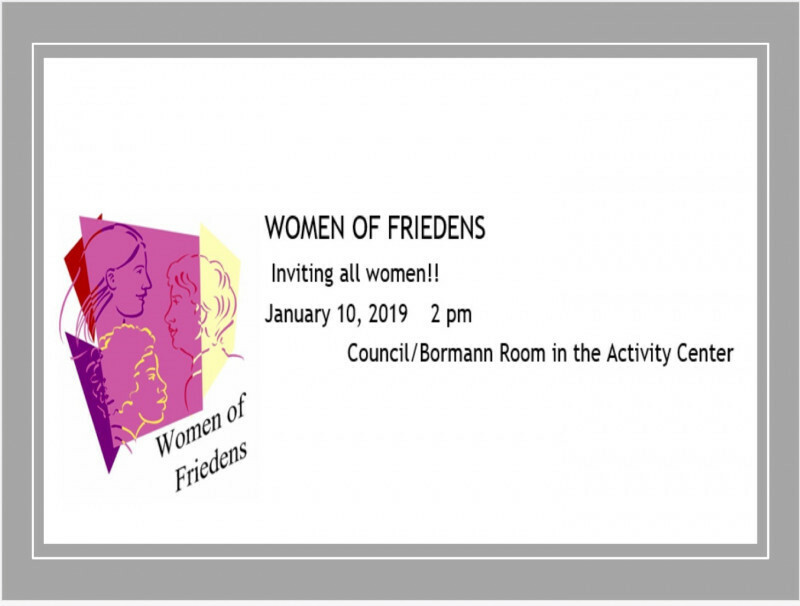 The Women of Friedens is a ministry for the women of the church. They meet on the second Thursday of every month at 2:00 p.m. in the chapel area of Friedens (Peace) United Church of Christ, except July and November. To unite all the women of the church in Christian fellowship; and with divine help and guidance, to develop an understanding of the work of the entire church, deepen spiritual life, stimulate sacrificial giving, and promote Christian service in the home, the local church, the denomination, the community, the nation, and the world. All women of Friedens (Peace) United Church of Christ are members of the Women of Friedens by virtue of their membership in the church. The Women of Friedens is an auxiliary organization, aiding and supporting the rest of the church program. It is an organized effort whereby one may better serve her Lord, her church, and her community; and deepen her own faith. All members are urged to attend our regular meetings on the 2nd Thursday of each month at 2:00 p.m. except July and November. Those members unable to attend are asked to participate in our Women of Friedens service Projects listed in this book. We need your help and support. Guests are always welcome. Our programs and meetings are followed by a social time. The continuing effort of the Women of Friedens is to try and meet the needs of the less fortunate wherever they are and whoever they may be. All women are encouraged to help with serving at funerals. The Women of Friedens designates its annual offering for a special program for mission work. We express our EVANGELISM by greeting guests who attend our church, and sending out cards to them to express our appreciation. We want to make those guests feel as welcomed and accepted, just as Christ makes us feel! We express our SPIRITUAL LIFE by conducting a program at Eden Hill one month per year. We bring coffee, angel food cakes, and presents for those with birthdays that month. Other churches take turns with the other remaining 11 months. We express our CHRISTIAN SERVICE by preparing and delivering Christmas gifts to our nursing home residents and shut-ins.